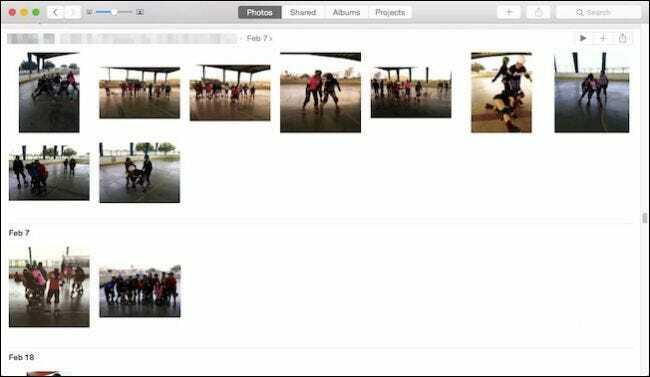 Apple’s new Photos app bridges the gap between Macs and iOS devices with photo syncing to iCloud. It’s a great little feature, but it’s safe to say some people may not want it. The convenience of iCloud photo sharing isn’t immediately apparent unless you use multiple Apple devices like an iPhone, an iPad, or a Mac. The idea behind this photo sharing is as soon as you take a picture with your iPhone, or import it to your Mac, it is synced and you can see it anywhere else you have one of those Apple devices logged into that iCloud account. It works surprisingly well, and it’s nice because it eliminates the need to import or send your photos to other devices. Simply give them a little time to upload and they’ll be downloaded to your Macs, iPads, iPhones, and iPods automatically. That said, you may not want to use iCloud photo syncing for any number of reasons. Perhaps you’re concerned about security or you only have one Mac and have little use for sharing. Regardless, you can turn it all off if you want. There are two ways to do this. The first way is to open the iCloud system preferences. Once you’ve opened the iCloud preferences, you’ll see many choices, any combination of which can turned off so they don’t sync to iCloud, or completely disabled by unchecking all of them (though signing out would be just as effective). We could simply click the check next to Photos, which completely disables it. But, we’ve decided to take a more nuanced route by clicking the “Options” button. A simple check means that if you don’t want to sync you mail or calendars, no problem. There are three further iCloud Photos options. Let’s go through each one so we understand what they do. 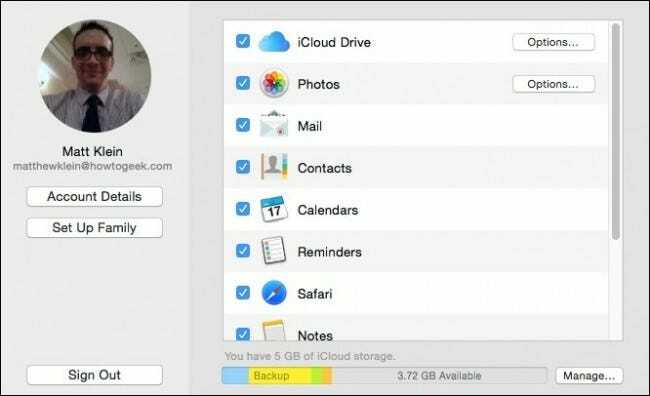 iCloud Photo Library – When you disable this, your computer will no longer sync your photos and videos to iCloud. Basically, your photos and videos will now be stored locally, which also means they won’t be automatically backed up to the cloud unless you move your Photo Library to another cloud folder (Dropbox, OneDrive, etc.). My Photo Stream – My Photo Stream extends beyond Photos or even Apple computers. You can access My Photo Stream from not only Macs, but Windows machines, iPods, iPads, iPhones, Apple TVs, and so on. When you turn this off, photos on your Mac will no longer be shared with any of those devices that dip into the stream. Any photos we add to our Photos app are automatically uploaded and shared with any other devices which are connected to My Photo Stream, unless you turn the option off. iCloud Photo Sharing – When you use something like Dropbox or OneDrive, you can share folders for viewing or collaborations with others. This option is the iCloud photo sharing equivalent of that. Turning it off just means that you’ll no longer be able to share your albums nor see other’s. It’s important to point out that the iCloud Photos options affect your entire system’s ability to upload and share videos and photos, effectively saving them locally. If you don’t back them up such as with Time Machine or another method, you could lose everything. At the very least, it might be a good idea to consider leaving the “iCloud Photo Library” option enabled until you make sure you have a backup solution firmly in place. Finally, if you are using the Photos app, there are more iCloud options in its preferences that you might want to know about. Open the app, access its “Preferences” (“Command + ,”), click the “iCloud” tab, and you will notice the difference right away. 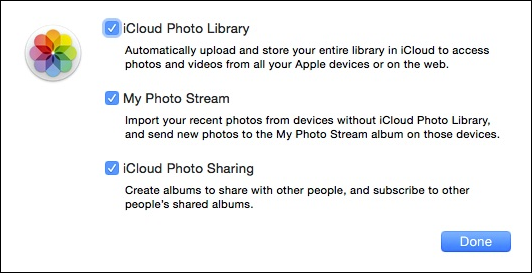 There are the “My Photo Stream” and “iCloud Photo Sharing” items as you’d expect, but under “iCloud Photo Library,” there are further options. It’s unlikely we will run out of storage soon, but it’s nice to know there’s an option to mitigate the problem if we do. Below that, you have two choices with regard to how photos and videos are stored on your Mac – you can download your originals so you have access to all your full-resolution versions, or you can elect to keep your full-resolution versions in the cloud, and only on your Mac if you have enough storage. 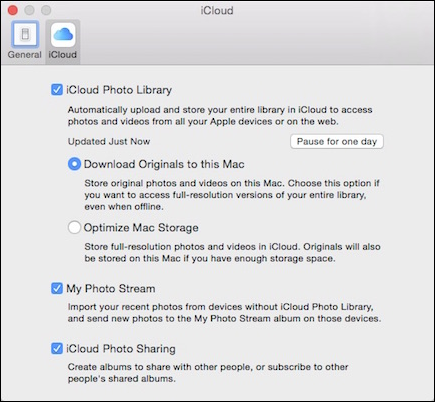 If you prefer to use another photos app such as iPhoto (which is no longer being developed or updated) or Picasa, then you’ll want to configure iCloud photos sharing with the system preferences versus from Photos. Just remember to set up your alternate backup method if you elect to not use iCloud. Have anything you would like to add such as a comment or question? Please feel free to leave your feedback in our discussion forum.